The College of Saint Benedict and Saint John’s University don’t actually offer classes on the raft at our on-campus beach, but our class sizes are small enough that we could. See more scenes from the raft at raftu.com. Catholic Benedictine Sponsorship: Benedictine men and women are actively involved on both campuses as professors, administrators, and role models; 60% of students are Catholic; students of all faiths are welcome. Faculty: 297 full time and 51 part time; 85% of full-time faculty mem-bers have the highest degree in their field; 100% of classes are taught by faculty members. 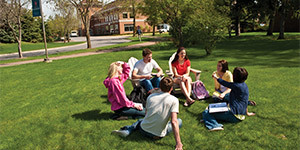 Academic Programs: Liberal arts curriculum; more than 60 areas of study, with 37 majors and 32 minor programs; semester schedule with a Summer Term focusing on internships, research, and international study; offering the Bachelor of Arts and Bachelor of Science in Nursing degrees; the student-faculty ratio is 12:1, and the average class size is 19. Residential Life: Through a four-year residency program, nearly all students live on campus. Graduation: 81% of CSB/SJU students complete their degree; more than 90% of those graduates finish within four years. Placement: 99% of 2014 graduates reported they are employed, engaged in a full-time volunteer program, or continuing their education. See detailed information at csbsjuresults.com. Costs & Financial Aid: 95% of students receive assistance in financing their education. Current information about scholarships and costs is available at csbsju.edu/admission/finaid. 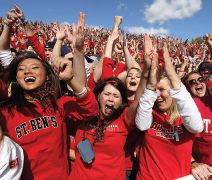 The College of Saint Benedict (CSB) and Saint John’s University (SJU) are ranked as two of the top three Catholic liberal arts colleges in the country. Through a unique partnership, CSB/SJU provide students the educational choices of a large university and the individual attention and community of a premier small college. Together, the schools offer more than 60 areas of study while retaining a low student-faculty ratio of 12:1. As Catholic colleges, CSB/SJU encourage students to put their values into practice through volunteer service in the local community and around the world. As Benedictine colleges, CSB/SJU are committed to ecumenism and interfaith dialogue, welcoming students from all of the world’s major religions. CSB/SJU share one combined curriculum. Students attend classes and activities together on both campuses, which are connected by a free shuttle service. Students from either school have access to the libraries, dining centers, and athletic facilities on both campuses. All students complete an independent research project, internship, or other engaged learning experience. CSB/SJU are located on 3,000 acres amid the woods and lakes of central Minnesota. With 15 miles of hiking trails, a private beach, and a paved bike path between campuses, the schools are the perfect place for an active student. Through a four-year residency program, nearly all students live on campus. An extraordinary sense of place and community shapes the undergraduate experience and creates a lifelong network of global connections. Ranked among the top undergrad-uate colleges for the number of students who study abroad, CSB/SJU are committed to global learning and connection. The Colleges enroll more than 200 international students from 31 countries and offer more than 200 courses that have a global focus.